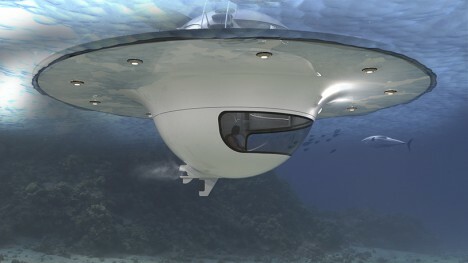 Here’s one UFO you won’t be seeing in the skies, but rather on the surface of the sea, half of its iconic shape disguised beneath the waves in the form of an underwater viewing dome. 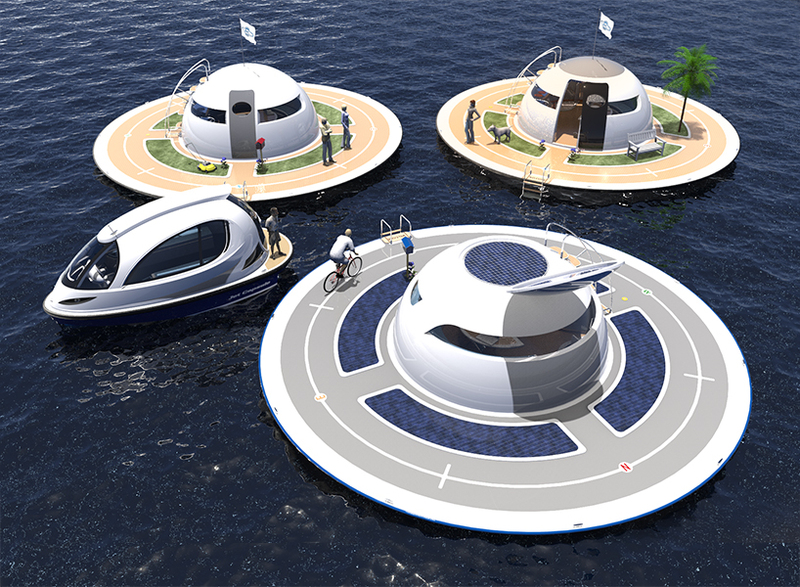 The ‘Unidentified Floating Object’ concept is the newest weird watercraft design from Italian water transportation company Jet Capsule, envisioned as a semi-autonomous floating home complete with a vegetable garden, water generator and wind turbine. You won’t get very far very fast, as this thing reaches a top speed of just 3.5mph, but it’s not meant to be a speedboat or even really a means of getting from one place to another. 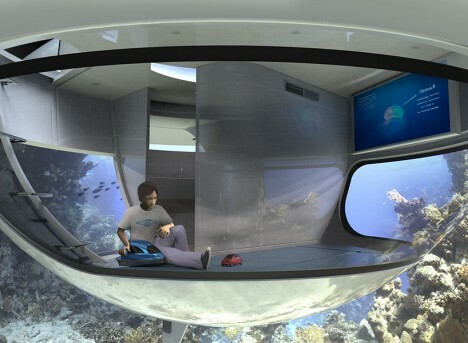 It’s a recreational watercraft crossed with a vacation home, offering habitable areas both above and below the surface of the water, including a sub-level bathroom where you can shower while gazing out at the surrounding marine life. 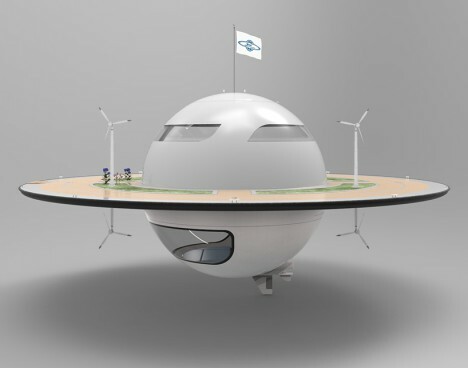 The flat ring around the central sphere functions as an exercise track for jogging or biking, and there’s a plantable strip so you can grow grass, flowers, trees or food. 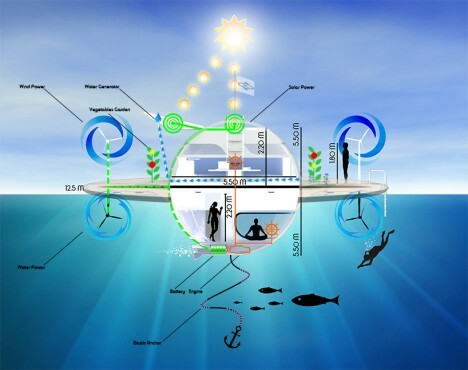 Opening the top hatch enables the collection of both solar energy and rainwater, and underwater turbines gather energy from the currents. There’s an anchor on an elastic cord so you can stay in place when you want to. 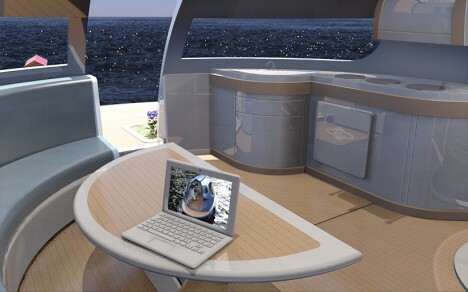 The top cabin features a built-in kitchen, semi-circular dining area and lots of windows for taking in the views, and the whole thing runs on a battery-powered jet motor. 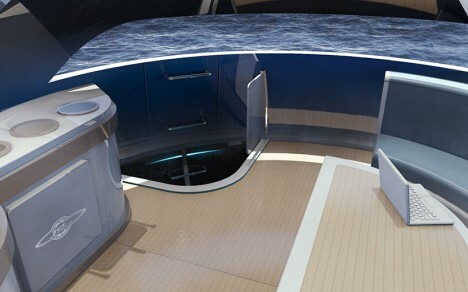 Jet Capsule is about to seek funding to create the first working prototype, with a Kickstarter launch reportedly coming soon, so it looks like they’re serious about getting this thing into the hands of consumers. No word yet on an estimated retail price.